This week is spirit week for Jack’s school and Wednesday was crazy hair day. 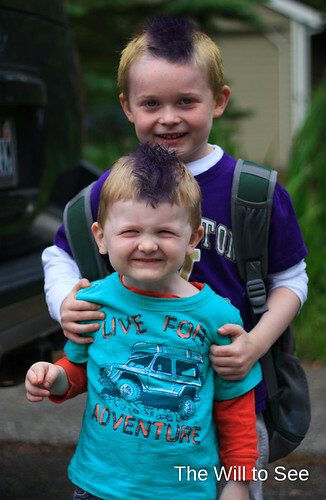 Jack decided he wanted a purple Mohawk and W on the back of his head and gold everywhere else (Husky pride). Will wanted to have funny hair too. He would reach up and feel his hair all day. I love that the boys like to participate in all the silly, fun activities like this.